Once again, the Yankees have an off-day today. They had an off-day Monday and a rainout Wednesday, and on Tuesday they played only five and a half innings before rain suspended the game. The Yankees will play about two hours of baseball from Monday through Thursday this week. At least everyone will be fresh for Friday’s series opener against the Royals. Anyway, I have some thoughts, so let’s get to ’em. 1. Tuesday night Masahiro Tanaka struggled through the first two innings, allowing three runs and getting away with several hangers, then he settled down and retired the final eleven batters he faced. After that second inning Tanaka pitched exclusively from the stretch, and I can’t remember him ever doing that before. Going to stretch is a classic “my mechanics are bad right now and I need to simplify things” adjustment. I’m curious to see whether he sticks with it going forward. Stephen Strasburg has been pitching from the stretch last year. Yu Darvish and Shohei Ohtani pitch from the stretch full-time as well. There are a bunch of others out there. Tanaka is not a power pitcher. He needs his mechanics to be locked in and his command to be precise to succeed, and if pitching from the stretch helps him do that, I say go for it. Do what works. That said, when it comes to making adjustments and figuring out what works and what doesn’t work on the fly, I trust Tanaka more than anyone on the pitching staff. I just thought it was interesting he went to the stretch in the middle of the start and started racking up outs. I can’t remember seeing Tanaka pitch from the stretch full-time at any point in the past. 2. The Yankees activated Brandon Drury off the disabled list and optioned him to Triple-A earlier this week. They’ll probably do the same with Billy McKinney when he’s healthy. Greg Bird is nearing a return, and once he’s back, it’s possible if not likely Tyler Austin will be sent down. Tommy Kahnle and Adam Warren are due to return before the end of the month and they’ll push more players off the roster. Clint Frazier could be returning to Triple-A soon. Adam Lind is sitting in Triple-A. Point is, the Yankees have several legitimate MLB caliber players stashed in Triple-A, or will soon. There are not 30 better third basemen in the league than Drury. There are not 90 better outfielders than Frazier and McKinney. The Yankees have dealt with a lot of injuries early this year — they’ve had a large volume of injuries, though fortunately most of their core players have stayed healthy — and they’ve thrived anyway because they have high-caliber depth. It starts with a strong farm system. Can’t say enough about it. Producing stars like Aaron Judge and Luis Severino gets all the attention and deservedly so, but there’s also something to be said for having quality depth (Austin when Bird gets hurt, Miguel Andujar when Drury gets hurt, Domingo German when Jordan Montgomery gets hurt, etc.) and being able to fill in the gaps with guys who are better than replacement level and have upside. I’ve said this before and it’s worth repeating: The Yankees have a higher internal replacement level than most teams. By the end of the month, they could have Drury, Frazier, Wade, Austin, Lind, and Jonathan Holder (and Tyler Wade!) sitting in Triple-A. That’s real nice depth. Not a coincidence. 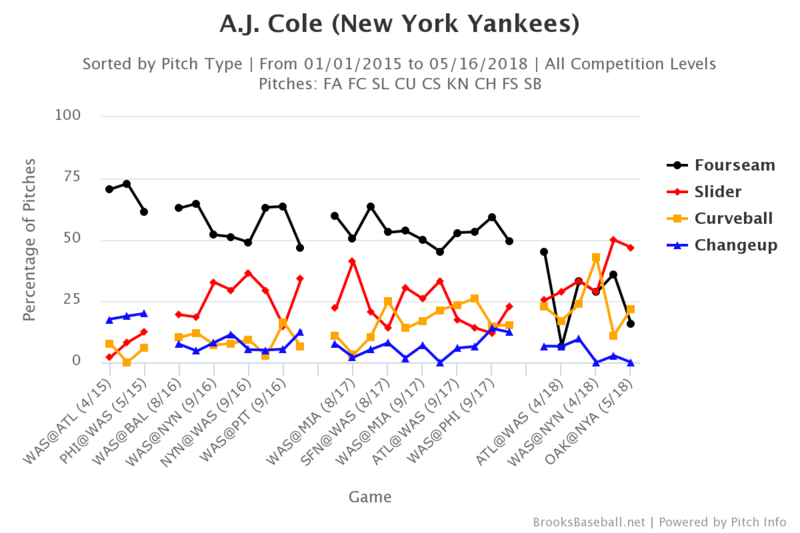 Cole has a pretty good slider and the Yankees are all about emphasizing secondary pitches. I’m glad the Yankees stuck with the 26-year-old Cole over the 30-year-old David Hale when it came time to drop the eighth reliever, and while I have no illusions of Cole sticking long-term, maybe the Yankees can squeeze a few good long relief appearances out of him by emphasizing that slider. He’s already given them one good game, those two scoreless innings in Saturday’s extra-innings win over the Athletics. That alone made the cash trade worth it. Cole probably is what he is at this point — he’s a former top 100 prospect who got a lot less interesting when his fastball went from 95-96 mph to 91-92 mph a few years ago — though if the anti-fastball thing helps him stick around in the big leagues, great. And if he does it with the Yankees, even better. 4. The Yankees got literally nothing in return — Jabari Blash was gone before the Grapefruit League season started — but wow has the Chase Headley/Bryan Mitchell trade worked out well. The Padres essentially bought Mitchell by absorbing Headley and his $13M salary, and going into last night’s game Mitchell had a 6.21 ERA (6.66 FIP) with way more walks (29) than strikeouts (18) in 37.2 innings — among the 130 pitchers with at least 30 innings pitched, Mitchell has the lowest strikeout rate and the third highest walk rate — while Headley hit .115/.233/.135 (15 wRC+) as a part-time player before being designated for assignment a few days ago. Yeesh. Mitchell is out of minor league options and he was probably going to be a 40-man roster casualty over the winter. Instead, the Yankees were able to use him to unload Headley’s salary and make getting under the $197M luxury tax salary easier. It’s hard to get nothing in return and still come out ahead, but the Yankees certainly have with this trade. Maybe, once Headley becomes a free agent, the Yankees will bring him back at the pro-rated portion of the league minimum if Andujar stops hitting or Bird suffers a setback? Doubt it, though it would make this trade all the more ridiculous. Mickey Callaway, Mets: Gave the umpires the wrong lineup card. Gabe Kapler, Phillies: Forgot to warm up a reliever before taking out the starter. Dave Martinez, Nationals: Made a pitching change before the pinch-hitter was announced. That’s Managing 101 stuff right here. Boone’s only managerial blunder to date was the “no one told Adam Warren to warm up” thing in Spring Training, which thankfully happened during Spring Training and not during the regular season. We could nitpick individual bullpen moves and lineup decisions and whatnot until we’re blue in the face, but overall, things have run smoothly so far this year, and the players seem happy. Once we get into the dog days of summer, when the grind really begins, we’ll see how well Boone’s clubhouse skills translate on the field. Right now, all is well with the new skipper. 6. Really weird schedule this year, huh? The Yankees are going to play two series against the Angels and two series against the Astros before making their first trip to Camden Yards. Their first game in Tropicana Field will be their 75th game of the season. Really weird. It’s not just the Yankees either. At one point earlier this season the Dodgers had played 12 games against the Diamondbacks, ten games against the Giants, and 14 games against everyone else. I mean, what? I guess having so many games against the Orioles and Rays later in the season — 28 of the Yankees’ final 95 games are against the O’s and Rays, so basically three out of every ten — is a good thing because those teams are not very good, and bad teams tend to get worse as the season progresses, not better. It’s just very odd that the Yankees have so few games against two division rivals early in the season. They’re going to get the bulk of their AL Central and AL West games out of the way before really diving into AL East games. I know building the schedule isn’t easy. Can’t they build a more balanced schedule than this though? 7. We’ve been running our weekly Fan Confidence Poll since Spring Training 2009, and I don’t know how often any of you check the graph, but last week’s score (8.71) was the highest since April 2010 (8.93 on April 19th, 2010). There’s a lot of recency bias in the Fan Confidence Poll — when the Yankees have a good week it skyrockets and when they have a bad week it plummets, etc. — though look at the graph and the overall trend is obvious. No one felt good about the state of the Yankees from 2013-16, but, since the start of last season, fan confidence has been steadily climbing, and now it’s higher than it’s been at any point in the last eight years. Eight years! That’s pretty wild. And fans should feel great about the Yankees right now. They’re winning, the Major League team is loaded with high-end young talent, and there’s more help on the way in the farm system. The Yankees haven’t been this healthy as an organization probably since the late-1990s. Even the 2009 team needed an infusion of big money free agents to contend because there wasn’t much in the farm system. 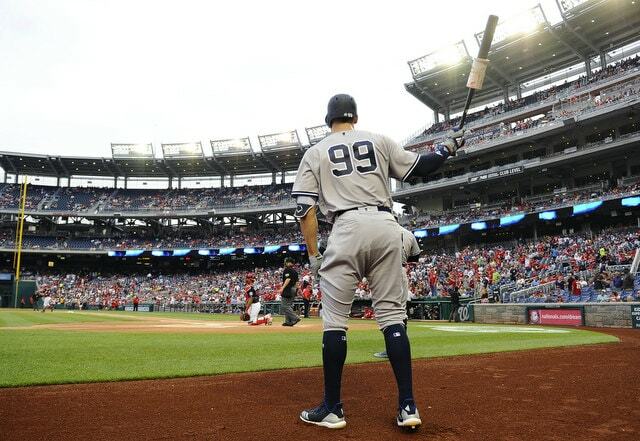 The Yankees right now have a much better chance at sustained success, and that’s exciting.